I have been enormously fortunate to meet and associate on the internet and in person with some really creative people involved with Tunnels & Trolls. A group of us have decided to try to produce some high quality material; solos, GM adventures and perhaps other supplements. Andy Holmes, Jason Mills, Simon Lee Tranter, Jeff Freels, Mari Volmar and web guru Andy James are the individuals involved as well as me of course. This enterprise is called Tavernmaster Games and we have already achieved our first publication "Devotion to Duty" detailed below. I am rather proud not only of our group achievment in bringing it to press but also as the writer I get a special glow whenever I see the front cover. STOP PRESS. August 2012. 2 NEW SOLOS RELEASED! 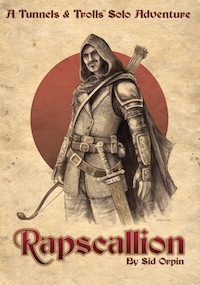 Rapscallion is a solitaire adventure for use with the Tunnels & Trolls role-playing system created by Ken St.Andre. It has been designed for use with version 7.5 of the rules but could easily be adapted for use with earlier editions. Sideshow is a mini solitaire adventure for use with the Tunnels & Trolls role-playing system created by Ken St.Andre. Roll up! Roll up! 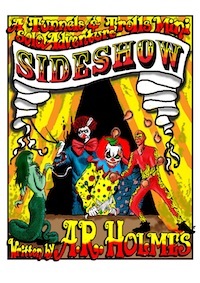 Come and visit the Sideshow. With time on your hands after a night of satisfying all of your desires what better way to spend a few happy hours than to enter the colourful tents that you discover down a quiet alley in an unknown part of town? After all, what could there be here that would pose any sort of threat to an adventurer like you? Sideshow is a mini-solo adventure for use with Tunnels & Trolls. It was designed with the 5th Edition of the Rules in mind but can be easily adapted for other Editions. It is suitable for first-level characters only and some magic spells are permitted. In addition to the solo adventure, this special edition includes a section with descriptions and a map that will allow it to be used as a GM Adventure. Jeff Freels is a great friend to all of us at Tavernmaster Games and to the world of Tunnels & Trolls as a whole. He desperately needs a kidney transplant and all the proceeds from this project will be donated to his transplant fund. STOP PRESS. OCTOBER 2011. 2 NEW MINI SOLOS RELEASED! 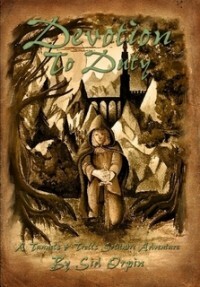 Devotion to Duty is a mini solitaire adventure for use with the Tunnels & Trolls role-playing system created by Ken St.Andre. 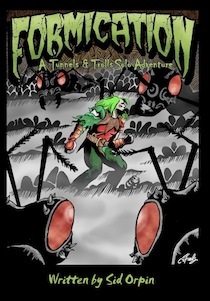 Formication is my second mini solitaire adventure for use with the Tunnels & Trolls role-playing system created by Ken St.Andre. You are a newly commissioned officer in the Royal Guard of the fairy kingdom of Cerinor. Captured by your sworn enemy, the batkin hordes of the Marble Mountains, you have been sent into a nest of giant fire ants to retrieve ant larvae for the delectation of the batkin hierarchy. Can you survive in the claustrophobic confines of the ant colony long enough to be able to attempt to escape or will the creatures of entymological nightmare within put an end to your adventures for good? 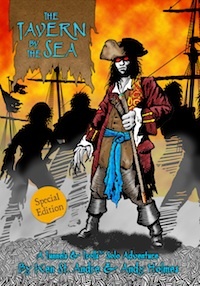 The Tavern by the Sea is a mini solitaire adventure written by Tunnels & Trolls' creator Ken St.Andre and the briliant Andy Holmes. A hundred miles south of Knor lies the fishing village of Frargg, home to the infamous Seven Ayes Tavern. The Seven Ayes has become synonymous with all manner of seaside tavern life including brawling, sea shanties, gambling, ruffians and pirates. It is also a good place for adventures to begin, and to end. Step inside, where your next adventure awaits, but tread with care my friend, as danger lurks within and death could be just a moment away. . . This special UK version of this solo features additional material, in effect a whole extra mini-adventure, written by Andy Holmes as well as completely new art work by Jeff Freels. Jeff is a great friend to all of us at Tavernmaster Games and to the world of Tunnels & Trolls as a whole. He desperately needs a kidney transplant and all the proceeds from this project will be donated to his transplant fund.